FQB "Sun-Kissed" Collection will warm your thoughts and creations with memories of the lake, ocean, cottage or pool! Summer is lived outdoors and what a better place to be in the heat of the days than at the water's edge. This fun and colourful digital scrapbooking and card making kit will get you creating with ease. All of the digital elements you would expect to create the perfect cards/invitations, scrapbook layouts, mini albums and craft projects! 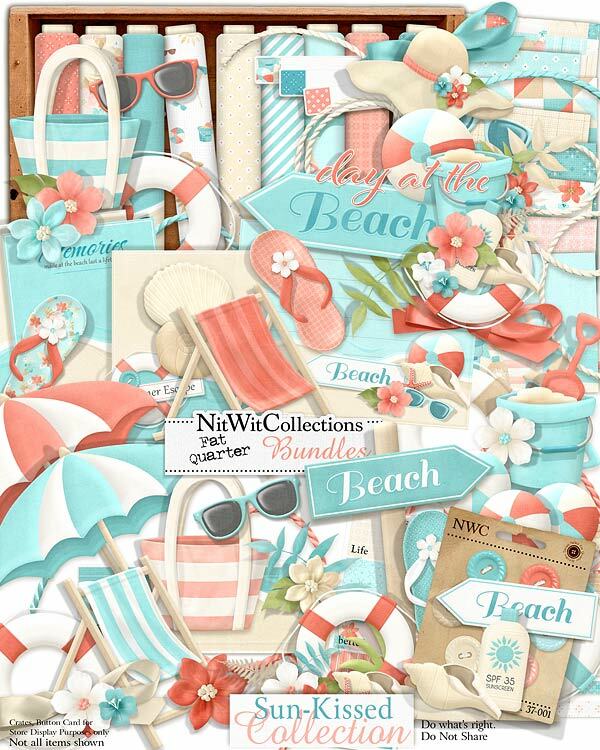 Feel the sun on your back, the sand in your toes and start "playing" with this whimsical digital kit. 3 Beach balls to get "playing" with! We gave you extra in case you pop one! 1 Bucket that is empty...do you see it filled with water or sand? 1 "Day at the Beach" element cluster...doesn't it make you want to go now?! 3 Flip flops in three different colours....make sure you don't lose them in the water! 7 Flowers to give your layouts, mini albums and cards a more elegant side. Is it a more formal beach party invitation that you see with these or perhaps a romantic getaway layout that you are creating...we have it all! 2 Leaves in two different shades....doesn't this leaf remind you of the tropical shade trees?? 2 Shovels, one in coral and one in blue....no fighting over the shovel at the beach! 3 Sun glasses in three different colours....what looks best on you?! 1 Bottle of sunscreen....SPF 35....safety first! 2 Umbrellas to shade you from a burn so you can come home and sit in your chair and create without a painful sunburn!